It is quite a spectacle to see a 'Starling Roost'. 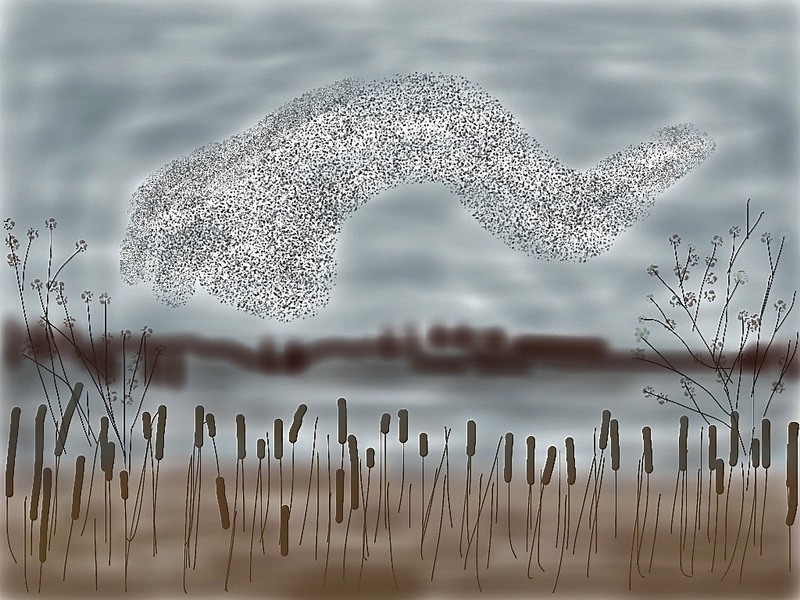 Large flocks perform an aerobatic display prior to dropping down to roost into trees, bushes or reeds. This happens throughout the autumn and winter time. One of the reasons they behave like this is for safety. They make it really difficult for a raptor like a Peregrine to catch one single bird as it confuses the attacker by the erratic flying around. This is my favorite so far of your efforts. 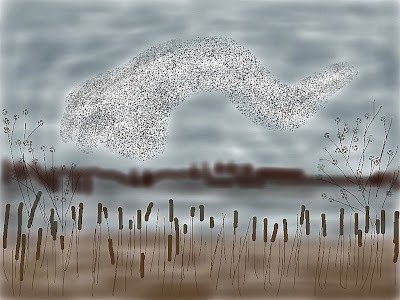 I like the starkness of the reeds in the foreground, the sinuosity (probably not a word, but you know what I mean) of the mass of starlings, against the softness of the background. It is a word actually, "The ability to curve or bend easily and flexibly." ...love this piece. Really has the feel of the air ballet of a starling roost. We have a winter roost in our area. It is spectacular when they sweep through the skies. I am amazed you can do this on an ipad! Well done. Do tell me more or where I can go to find out. I was watching Hockney doing things on his ipad and am rather keen myself to have a go. The background is more subtle that I would have thought possible using this medium. Thanks. Thanks Sweff. The software app I have downloaded onto my iPad is called "Brushes". Its the one used by David Hockney. Hi Roy: I crept up on your beautiful iPad drawings when you weren't looking! I think they are outstanding. Best wishes and sorry to read about someone 'stealing' your blog name and you having to change it all around.